Disgusted by the tyrannous behaviour of the Taira, the senior Minamoto in the capital, Yorimasa, secretly convinced Prince Mochihito, the second son of retired emperor Go-Shirakawa, to rise from obscurity and lead a rebellion to claim his birthright and the throne. Gathering Minamoto loyalists the two slipped out of the capital to the temple of Miidera and enlisted the monks there to join their cause. From there they petitioned the monks of Mt Hiei and Nara to join their rebellion. The Hiei temples refused, reputedly bribed by Taira no Kiyomori, but the Nara monks agreed. 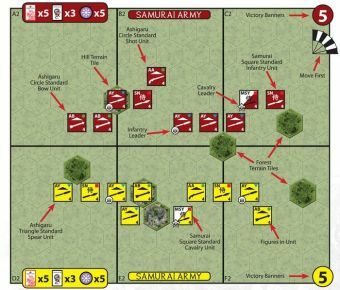 Outnumbered by a large Taira army approaching Miidera, the mixed rebel force of Minamoto samurai and monks abandoned the temple and sped south toward their allies in Nara. In danger of being overtaken by the swiftly pursuing Taira, they stopped on the southern bank of the Uji River, by the Byodo-in, the great Phoenix Hall, and partially dismantled the bridge. When the Taira arrived they attempted to charge across the bridge but with most of the planking removed, hundreds of Taira soldiers fell into the river to drown. Several monks moved out onto the beams of the dismantled bridge and challenged the Taira warriors, demonstrating astounding feats of martial prowess which at once impressed and enraged the Taira troops. 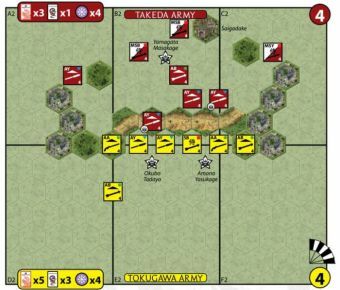 Faced by an impassable bridge, a river in dangerous flood from recent rains and a desperate and defiant enemy on the opposite bank, the Taira commanders were at a loss how to proceed. Their dilemma was solved by a provincial retainer, Ashikaga no Matataro Tadatsuna, who swam the torrent with his cavalry, and charged the Byodo-in. 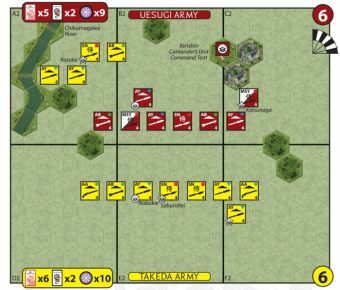 Emboldened by his show of daring the rest of the Taira forces plunged into the river and although many were swept away, their numbers were so great that their bodies effectively dammed the current, allowing those downstream to charge across unimpeded. The outnumbered rebels were overwhelmed. Defended by his sons, Yorimasa retired to the Byodo-in and committed seppuku. Prince Mochihito fled south toward the sanctuary of Nara with a small bodyguard of Sohei but was overtaken by Taira horsemen and killed. The force of Nara monks marching toward Uji to reinforce the rebels, only minutes from arriving in time, heard of the defeat and retreated back to Nara. The first resistance to Taira power had been crushed but the spark of rebellion had been lit. The Genpei War had begun. 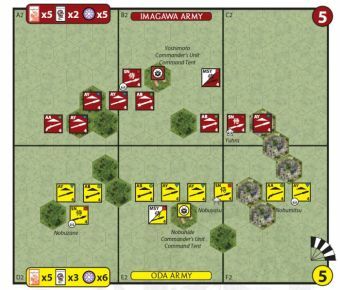 The Rebel Command Tent is worth 3 Victory Banners to the Taira if eliminated in combat. 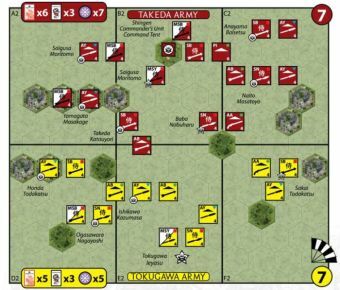 The Taira may not win unless they have a leader or unit on the Rebel side of the river at the same time as they have 6 Victory Banners. - The Uji River is 2 hexes wide. 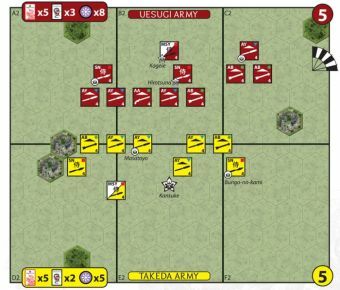 - At the end of each player’s turn, roll 1 die for each of that army’s units or lone leaders on a river hex. For units, 1 figure is lost for each matching standard symbol rolled (this may incur a 1 die leader check if one is attached). Lone leaders are eliminated on a sword roll. - A bridge hex may not be entered or targeted in close combat from a river hex. - A unit entering a bridge hex loses 1 figure (this may incur a 1 die leader check if one is attached). A lone leader entering a bridge hex is unaffected. 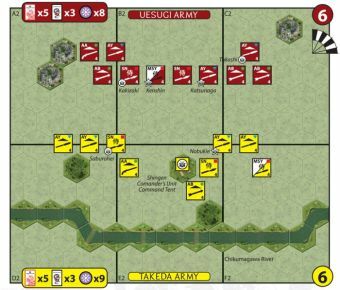 - Units may not exit a bridge hex onto the enemy side of the river. 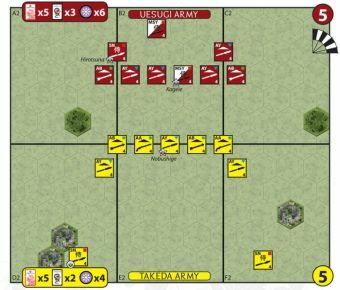 - 1 Victory Banner is granted to the army that controls the most bridge hexes at the start of its turn. This banner is lost immediately as soon as the army no longer controls the most bridge hexes. 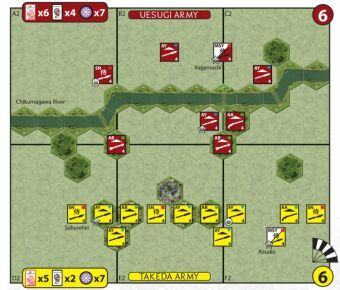 - At the end of an army’s turn it gains 1 H&F for each leader it has on a bridge hex.